I was not comfortable as a thirteen year old in October 1954 scrambling over those rocks around Nefyn point as darkness was falling. The tide was out, just starting to come in, and I was keeping myself well clear of the base of the cliff where there were deep crevasses in the rocks, which formed strange and eerie shadows. I had been exposed to sufficient local ghost stories about Nefyn beach and Nefyn point for my imagination to run wild. So while I was carefully trying to avoid slipping on the wet seaweed that covered the rocks, I was at the same time keeping a sharp eye on the base of that cliff just in case something out of the ordinary appeared. My task was a little complicated because I had knee high waders on, or sea-boots, as we used to call them. It was reassuring, now and then, to hear the voices of my father Lawrence Owen and my brother Mike as they quietly rowed our old M155 rowboat just a few yards offshore. We were on our way to fish with the draw-net, just around Nefyn point, in the remote eastern end of Morfa Nefyn beach. In that part of the beach, there is a heavy accumulation of stones and pebbles near the high water mark at the base of the cliffs, making the area unappealing to beachgoers. It is a very quiet area with little boating or swimming activities. There is an abundance of cowrie shells in the pebbles near the rocks, and oystercatcher’s nest among the stones on the beach. I spent hours on that beach as a child collecting cowries and trying to spot an oystercatcher’s nest. Locating a nest was not easy since it is just an accumulation of small pebbles amongst the stones on the beach and the eggs are extremely well camouflaged. Away from the stones, the beach has a sandy bottom, which comes into full view at low tide. Two rocky outcrops are also exposed at low tide, which together with the rocks on Nefyn Point form two little bays, each approximately 200 yards wide. The sand banks within those little bays are rich in sand eels and lugworms, and these attract large fish inshore especially when the tide turns. It was always a great place to spear flatfish such as plaice, flounder, and turbot in those tranquil June days when the sea was calm like a pond (another story). Anyway, it was those two little bays that we were targeting with the draw-net that evening. 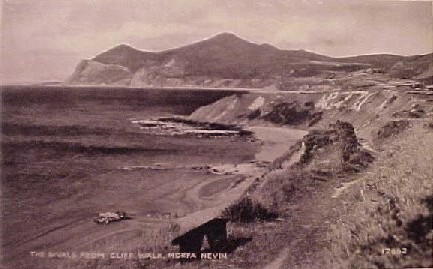 The rocks on Nefyn point, the cliffs, and the two little bays on Morfa Nefyn beach where we used the draw-net that night in October 1954. The draw-net is a very simple concept that has been used for a long time as a technique for catching fish. An area in the sea along the shoreline is encircled with a net cast from a boat, and then the net is drawn ashore trapping all the fish within that encircled area. It is hardly used in Britain nowadays since it is illegal and does not give the fish a fighting chance. But in those bleak days, just after World War II, fighting chance or not, it was most certainly used by local fishermen around the North Wales coast. My father had been draw netting for several years after returning from the Merchant Navy. He had, since that time, refined his draw-net technique to ensure the maximum amount of fishing success. His draw-net was approximately 150 yards long tapering from a height of 9 feet at the centre to approximately 6 feet at each end. The tapering of the net was necessary to ensure that the edges reached all the way from the surface to the bottom of the sea, consistent with the slope of the beaches in the local Nefyn area. The surface edge of the net had corks every two feet or so to insure adequate buoyancy, while the bottom edge of the net had lead weight eyelets every foot or so to keep that edge on the sand as the net was drawn ashore. A greater spread between the weights would allow flat fish such as plaice, skate, turbot or sole to bury just below the surface of the sand and escape beneath the net. The approaching net, in intimate contact with the sand, would panic the flatfish off the bottom ensuring they were caught. In the center of the net along its corked surface edge was a small metal buoy, and directly beneath that buoy was an 8 feet long, tapered net bag tied securely at its end. The purpose of the buoy was to indicate the precise dead center of the net, the last part of the net to be drawn ashore. The bag below the buoy was designed to open during the draw, trapping the fish and ensuring they would not slip over the net to escape. At each end of the net was a 5 feet long, 2 inch diameter wooden pole with a weight on its lower edge. The purpose of the poles was to keep the edges of the net apart, and automatically keep the cork edge of the net high as it was drawn into shallow waters.. A 25 feet length of rope was tied to the center of each pole to initially pull the net ashore. The draw-net was loaded on to a gurney custom designed for the job. The gurney had two handles at each end, and was designed to fit snugly between the gunnels and against the stern of our M155 14 foot rowing boat. The gurney in this position could not slide off the side, or off the stern, of the boat under any normal circumstance when fishing. The net would be loaded on the gurney in a very precise way.. This was critical in order to ensure the net would dispense off the gurney on the back of the boat in a smooth manner, and essentially all by itself. First the rope on one end of the net was coiled in the center of the gurney, followed by the pole that was placed across the coiled rope. Then two people would load the net on to the gurney, one person on the cork edge and the other on the lead weight edge. They would load the net, ensuring they were in synch with one another, cork edge on one side of the gurney and lead weight edge on the other side.. The loose netting in between would be periodically lifted on the gurney center. Then the pole on the other end would be placed on top of the net followed by its coiled rope. The gurney would then be lifted and loaded into its secure position on the back of the M155, always with the lead weight edge of the net away from the direction in which the draw was being made on the beach. The procedure of laying the net from the boat was also a very precise routine. My father would row while Mike stood in the back of the boat watching the net as it cast off the gurney. The boat would be reversed quietly ashore and the end of the rope on the top would be passed to me standing on the shoreline. I would then hold the end of the rope at the waters edge while the boat was quietly and slowly rowed initially straight out to sea until Mike lowered the first pole gently into the water. Then my father would start rowing the boat in the precise semi-circle. The intent during this phase was to keep the disturbances in the water from the rope, pole, net and oars to an absolute minimum to avoid scaring away the fish. When the boat reached the half way point in the semicircle and the buoy fell off the gurney, Mike would give a shout, and I would aggressively start pulling the net ashore with the rope.. As soon as all this was underway, my father would begin rowing in earnest, and at a high rate of speed to complete the semicircle. The second pole would fall in, and Mike would proceed to lash the water with the rope as the boat reached shore. The intent during this phase was to drive the fish towards my side of the net where, by now, I would have the end of the net ashore, closing the trap. Once both ends of the net were ashore, and while my father secured the boat, Mike and I would walk along the beach towards each other, holding the poles at the ends of the net upright. Then would begin the exciting phase of drawing the net ashore, keeping the buoy on center, and waiting for the arrival of the bag with hopefully a large catch. We had the procedure down to a fine art, maximizing the area of sea encircled by the net, and each draw was performed with precision and exactness. 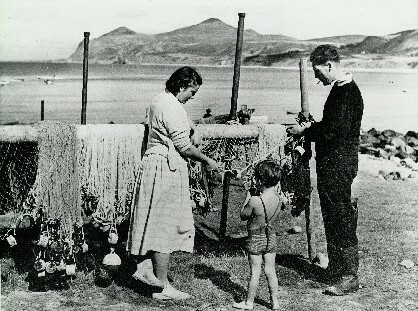 My father Lawrence Owen repairing his draw-net on Nefyn beach in the early 1950's. Also my mother Margaret, and my younger brother Terry who was about four years old at the time. The tide and the sea conditions also had to be right. The preference was to fish in the evening as darkness was falling, and when the tide was just starting to turn and come in. The wind had to be light and offshore to avoid any swell on the beach. Most importantly, there had to be very little floating seaweed at the waters edge. Seaweed caught in the net, added significant weight to the net, not only weighing down the boat, but also slowing down the whole procedure. And speed was essential to be successful with the draw-net. I scrambled off the Nefyn point rocks just as the boat was coming around the corner into the first little bay. I could see the boat being turned quietly to reverse towards the beach. I waded quietly into the water to receive the rope and to avoid the boat coming too close in shore to touch bottom. “Here you are” (Dyma chdi), said Mike as I grabbed the rope and waded back as the boat took off. It was a perfect night for draw-netting, calm, and with just the gentle lapping sound on the waters edge, as the lights from the Ty Coch Inn and Henborth in the distant Porthdinllaen corner of the beach reflected off the water. Then came the shout I was waiting for, and I proceeded to pull on the rope, as the boat gathered speed in the distance. My father was a very strong rower, and he could row at speed with hardly any noisy water disturbances. The oars, when out of the water, were held in a fully flat position just above the surface to minimize the sound of dripping water and the sound of a splash when the oars reentered. In the water, the oars were rotated for an extremely powerful pull, and he was still able to minimize even the gurgling sound made by that little whirlpool that emanates in the water from the tip of the oar. I got the net pole ashore easily, and I could hear Mike lashing the water aggressively in the distance. Then I began to move the pole along the beach towards the center as my father approached to help. “Perfect” (Perffaith), he said. He was obviously very pleased with the draw. As we pulled the net ashore, we were constantly on the alert for any unexpected developments such as the net getting stuck in something. There were also the local old-timer stories of when they surrounded a seal with the draw-net, and gallantly held on as the net started heading for ‘Timbucktoo’ before the seal tore a massive hole through the net. Or the time when Captain Lloyd and Williams Room didn’t know what on earth they had caught until the river otter (dyfrgi) walked proudly out of the net and up the beach with a bloody fish in its mouth. A river otter on the seashore, a story with a little stretch for sure, but just inhaled with awe by us youngsters. And that would just encourage an even further level of exaggerations, always ending in ghostly stories. The one about the two young fishermen with a draw-net on Aberdaron beach at night who were found ashen, speechless, in shock for several days, and who never set foot on that beach again. A headless man surrounded by a bluish hue had appeared right next to them as they were pulling the net ashore, and started talking to them in Spanish !! They just dropped everything, the net, the boat and all, and ran like crazy out of there. That’s why I continued to glance towards the cliffs periodically, as I pulled on the net towards the shore. My father was pulling one side on his own, while Mike and I pulled the other. A couple of bass came splashing ashore caught in the net on our side, and a large plaice followed a little later – a good sign for sure. “Something big is hitting my side of the net” (Mae rhiwbath mawr yn taro’n ochor i), said my father. Then I could even feel a definite greater drag than normal. “Keep on center, now” (Cadw yn y canol, rwan) he said as the buoy came into view. As we all focused on the buoy, about 30 feet or so offshore, it suddenly completely disappeared underwater. “Just keep going” (Daliwch i fynd) he said, adding that the weight of the fish in the bag must be large enough to pull the net underwater. A few seconds later, as we came into shallower water, the buoy came back into view, and the drag became significantly more acute. More fish were meshed in the sides of the net. Then the buoy came ashore, and the thrashing and splashing in the water just beyond it was unreal. The bag was full of fish and there were big ones. My father took one look at the bag on the sand, and headed for the M155, glancing in earnest along the beach, towards the rocks on Nefyn point, and up and down the cliffs. “Salmon” said Mike pointing to the head of a large fish sticking out from amongst all the others. Mike dragged the bag further up the beach and untied the end of the bag. The fish slid out into a big thrashing pile on the sand. The salmon was huge, but there was an even larger sea bass, together with several large red-spotted plaice and flounder, two smaller salmon, and a multitude of nice sized but smaller bass, cod, whiting, mullet, turbot etc etc. The boat rowed up, out came the oilskin bag, into the bag went the three salmon, and with the bag tied securely shut, out rowed my Dad towards Nefyn point. Catching salmon in Wales in the 1950’s was illegal. The salmon was the Queen’s fish and no one, at least among the ordinary citizens, was allowed to catch, be in possession, or even consume any of Her Majesty’s fish. The law was perceived as being directed towards the Welsh rivers, and for ensuring an ample supply of salmon for the fly fishing pleasures of the wealthy estate owners and rich businesses who virtually owned the rivers. Local water bailiffs, as they were called, supervised those rivers to ensure conformance with the laws and to prevent poaching. The same water bailiffs had jurisdiction over the salmon at sea as well, but the laws there were not as easily enforceable.. The catching of a salmon by local sea fishermen was, more often than not, an inadvertent act, but the fishermen were deemed just as guilty under the law if they had that salmon in their possession. The rule was to throw the salmon back as quickly as possible. The penalty of not doing so was a ridiculously heavy fine, and the confiscation of the boat and all the equipment associated with catching the salmon. That was a very severe penalty for the local small fisherman. But not a single fisherman in the Nefyn area, that I was aware of, would even dream of throwing such a fish, already probably dead, back in to the sea for the crabs to eat. That just did not make any sense, especially when there were so many families with children in the area with their father’s on the dole and without any hope of employment. Be prepared was the motto, and prepared we were. The oilskin bag and its contents was quickly deposited in one of my father’s lobster pots just off Nefyn point, left there for cleaning and filleting while lobstering the following day, and then brought ashore at a more opportune time. Upon returning, the rest of the fish were dumped in the bottom of the boat, the net was reassembled on the gurney, and we proceeded for the draw in the second little bay. I do not recall exactly what we caught in that next bay, but since we had enough fish after both draws, my Dad decided to call it a night. Catching too many fish was just wasteful since refrigeration, as we know it today, was certainly not common in rural Wales at that time. The whole trip had taken approximately three hours from beginning to end. We headed back around Nefyn point, with me sitting on the net in the boat this time, and Mike walking around the rocks. When we pulled the boat on the old slipway in the corner of Nefyn beach, Mike was waiting for us. Leaving the boat on the slipway, we proceeded to unload the gurney and pull the net on to one of the herring net poles that were abundant in those days in that corner. We then proceeded to pull the M155 boat, with the fish in it, up the slipway above the high water mark. And that’s when two flashlights came on, focused on us, and the fish covering the bottom of the boat. My Dad had sensed their presence earlier and shone his own flashlight carried on his belt, at the source of the light. “Hyia, Jack” he said. “Any salmon, Lawrence ?” came the quick response. “Take a look in the boat if you want to” said my father “but don’t steal any of the fish ”. I heard the two bailiffs muttering something under their breath, and then there were comments about the size of the bass and that it was the biggest one they had seen in several years. Then they were on their way with no problems. Had the salmon been in the boat though, it would have been a completely different story. The large salmon weighed over 9lbs when a scale was taken out to the lobster pot the following morning.. The bass was an astonishing 13lbs. Most of the fish were sold locally with the big bass going to the Nanhoron Arms Hotel as I recall. The following evening we had salmon for supper. Not the canned version from Anchorage, Alaska, but an honest to goodness Welsh one from Morfa Nefyn beach. “It’s only the Queen and our family that is eating salmon tonight” said my father, and we all thanked her graciously. We did not like salmon very much anyway. The whole family preferred mackerel or plaice. But at least the salmon was consumed by someone a little more deserving than a few crab on Nefyn point. Such were the pleasures of growing up, and experiencing the good life, in Nefyn Wales in the 1950’s.